How can I improve a Q44 in a month? 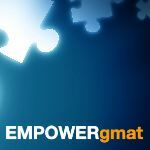 I recently took my first official GMAT and I scored 690 (Q44, V40, IR7). I would like to apply to some of the top 20 business schools in Europe (LSE, HEC, LBS, ESCP...) for a pre-experience master (in finance or international management) so I believe that I'm going to have to retake the exam, mostly because of my quant score which is embarrassing, especially since I've always thought to be quite good at math. I am an Italian studying economics and management in Italy, I have a 4.0 GPA, an internship in consulting at a big 4, I will be studying at Warthon for a semester next year and I have also taken a summer course at LSE last summer. What do you think is the quant score that I should aim to, to have a good shot? I have been studying for 10 weeks from the OG guide and an online course, which I didn't find to be that useful. I scored a 700 (Q42, V42) 3 weeks after I started studying, but my last CAT (after 7 weeks) was a 710 (Q46, V42) and my official score was 690 (Q44, V40), hence in 10 weeks I haven't gotten that better in quant. What do you guys think I should do? Should I try another online course, or should I buy some particular books? I like the idea of studying at my own pace online, but there are so many different courses and I really need one that can help me to improve in quant. I would like to retake the exam in about a month. Thank you so much for your time in advance, a response would really mean a lot. You can try out the TTP course as it is phenomenal and covers the entire syllabus really well. Plus it has great reviews on GMATCLUB. I must add that if you are particularly looking to discover and improve on your weak areas in Quant; a subscription to GMATCLUB tests is the best way to do that. They are indeed phenomenal and will not only pinpoint your weak areas but also help you improve on them. Lastly I would also encourage you to purchase the GMATPREP QP 1 for some great additional practice. You will also find the following link helpful. Hi for Quant improvement try with TTP or eGMAT. Once syllabus completed, do the practice in GMATClub along with your course questions. Then do the mocks in Official or Manhattan. I’m glad you reached out, and I’m happy to help. So, since you have been studying for some time and have made little improvement in your quant score, you need to look at HOW you have been studying and make some changes. Right? That said, since you need quant help, I agree with @kirn120680 that TTP would be an amazing resource for you. In fact, check out this recent success story in which a TTP student improved from a Q44 to Q50. If you have any further questions or would like to learn more about the TTP course, feel free to reach out. 1) Work on your weak areas; So don't skip any topic. Do everything because you may get an easy q on any topic and you don't want to get an easy question wrong. 2) Practice, practice, and practice. There is no short cut to success!! But do understand GMAT is a reasoning test and not a Math test. So you should do the practice in the right way that is by solving questions using reasoning not just by doing the math. Many Business Schools view an Applicant's Quant Scaled Score as an indicator of how that Applicant might handle the 'academic side' of the Program - and a Q44 won't impress anyone. Highly-Competitive Programs (and especially Finance Programs) place a heavy emphasis on the Quant Scaled Score. With a Q44, you likely know most (if not all) of the math just fine, but you made some little mistakes as you worked through the section and you missed out on LOTS of 'strategy-based' points. This is meant to say that by focusing on Quant Tactics, you'll be better able to increase your GMAT Score AND better impress how Business School Admissions Officers will view your potential to handle the Program. 1) How have you scored on EACH of your CATs (including the Quant and Verbal Scaled Scores for EACH)? 2) Do you have an exact Test Date yet (and if so, then what is it?)? 3) What application deadlines are you considering? V40 is a really good verbal score. If you devote most of your preparation time for quant you can definitely achieve a very good score. For Quant I would suggest you go thru Manhattan Quant guides, which will solidify your basics and couple them with GMAT club tests, which will help you to reach Q49 atleast.